Update: the Functional Ear Trainer app is now also available for iOS. Download links have been added. However, this remains an Android test review. I don't have an iOS device and therefore can't check for differences. Considering the high-quality of the app and the attention of detail the developer Serhii​ Korchan has put into the Android version, I am confident that Apple users will be happy with their version as well. Where to download an excellent Android ear training app for free. What the functional ear training method is about. How the Functional Ear Trainer app works. The advantages of the "Movable Do" solfege style. How to create your personalized ear training exercises. Here's a quick summary to give you an overview. Make sure to read the rest of the article for more details and lots of additional information. Very easy to use - learn the functional ear training method step-by-step with the help of this app. Clean, minimalistic design that does not get in the way. Great app that helps you develop one of the most valuable skills - and it's free. Summary: If you are a musician (regardless of the instrument you play, or what styles you are into) and you have an Android phone or tablet - then you absolutely need this app. Period. It's like having your personal ear training coach in your pocket, ready to work with you on a quick, valuable and effective ear training session wherever you are. The Functional Ear Trainer is a must-have app for any musician. The app is 100% free! 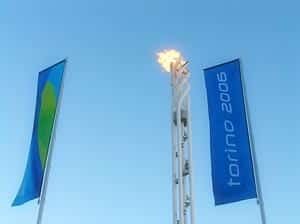 December 2005 – the Winter Olympics are approaching and the Austrian broadcasting corporation ORF wants to have some fresh tracks produced. The 3 of us (my 2 co-producers and me) go to work. I do my teaching and then spend the remaining hours of my days producing tracks to meet the ridiculous deadline so that our material would end up in the roster for the broadcasting. We get great feedback on our tracks, but when we watch the Olympics we don’t hear any of them. Apparently something didn’t work as expected with the new upload/online access system the broadcasting corporation was testing and the reporting crews in the field ended up using tracks they already had on their local drives or on CDs. What’s a setback like this when you are young, having fun, learning a lot and now your foot’s in the TV door? We produce more tracks, actually, a ton of tracks. The feedback gets more enthusiastic with each release as well. We catch our tracks on TV. You turn on the telly and there’s a slow motion summary of the Kitzbühel ski race (arguably the biggest skiing event after an Olympic or World Championship race) and in the background there’s your music providing the sound track for the winner jumping down the Mausefalle. So, we’ll be rolling in the dough come royalty payment time, right? In my 2014 post I announced that the biggest goal I was going to work on this year was my album project. One track/month would lead me to a finished album at the end of 2014. Go ahead and ask how many tracks I’ve completed so far? Yep, you guessed it – a big, fat ZERO. It’s funny how quickly plans can change. Within 2 weeks of making my public announcement, my good friend Bernie (the best guitar student I never had / until recently “Tangerine Dream” guitarist) and I decided to resurrect an old project. 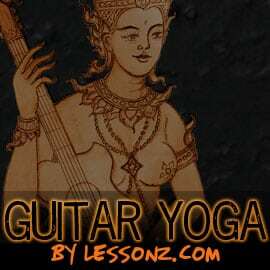 See, back in 2009 we already had worked on a video guitar course together with another friend. We shot more than 600 video clips in a green-screen studio we built ourselves. More than 800 people signed up for the course and there were articles in the Austrian press about us and our course. Still, we put the project on ice after our friend got a great job offer he simply could not refuse. One of the unexpected awesome fringe benefits of running a site is that you get in touch with some really cool people. 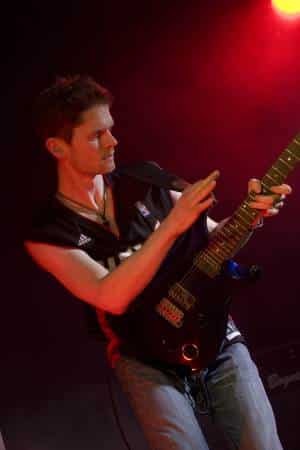 After publishing my initial 12 Great Android Apps for Musicians article I got contacted by guitarist Stuart Bahn. Stuart wanted to know if I’d be willing to test an app that he had developed. I checked it out, it worked great (really useful for any improvising musician) and featured his app in my follow-up post More Great Android Apps for Musicians. But to my surprise, shame and delight (I’m always happy to see people succeed) I found out that it wasn’t something in the beginning stages, but rather a project close to the end. I immediately asked Stuart if he’d be willing to answer some questions in some sort of interview for AdvancingMusician – since I find the topic of how to optimise practising fascinating. 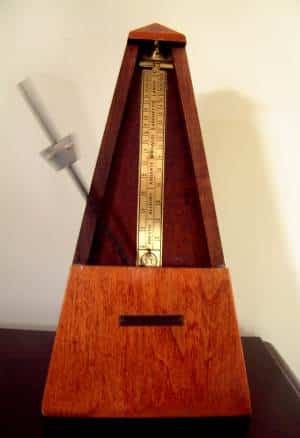 Back in the stone age of the pre-digital era when I started with piano lessons, a metronome was a weird device. First you had to turn a key mechanism at the back of the device – like in a music box to wind it up. And there was a small weight attached to a pendulum where you could set the tempo by adjusting where the weight thingie would snap into place on that pendulum-like stick. The lower you put the weight, the faster the metronome ticked. Even as a kid I could appreciate the craftsmanship and the thought that went into this little contraption. But once you had to practice with that damn thing, the relationship turned sour rather quickly. It had the annoying habit to change tempo on you. In easy passages it always got slower, while in difficult passages it increased the tempo “forcing” you to mess up. But we all know that developing good timing is essential and well worth the pains you have to go through. So, a love/hate relationship with metronomes, is that what it boils down to?